Besides the fact that it has a cool name, Bavarian Lion Vineyard in the Knight’s Valley AVA (also a pretty awesome name) of Sonoma County is one of the most ideal spots for growing the heat-loving Cabernet Sauvignon grape. Here, in the crevice of the Vacas Mountain, the vineyard is unaffected by maritime influences from the Pacific Ocean. The warm climate combined with the less-fertile volcanic soils that make up the terroir means that the vines produce smaller berries rich with concentrated flavors — not unlike those found in France’s Bordeaux region, where Cab was first crowned king. 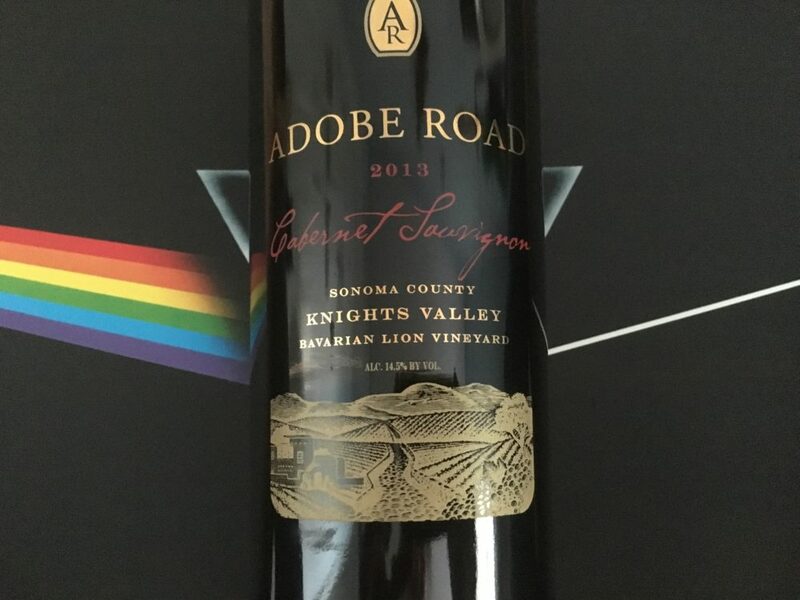 Adobe Road crafts a wine that expresses the true nature of these grapes — austere in its youth, but with a deep-rooted maturity that means wine lovers can enjoy this Cabernet Sauvignon today and for many years to come. About the Wine: The Adobe Road 2013 Bavarian Lion Vineyard Cabernet Sauvignon is made from 100% Cabernet Sauvignon grapes sourced from the Bavarian Lion Vineyard in the Knights Valley AVA of Sonoma County. Flavor Profile: In the glass the Adobe Road 2013 Bavarian Lion Vineyard Cabernet Sauvignon is a dark purple-maroon that slowly, almost unnoticeably, fades to a rusty-rose color toward the perimeter. Initial aromas are warm with chocolate covered cranberries, eucalyptus, a tamari-like umaminess, and a subtle background of dried pink rose petals. Swirl and awaken the fruits — boysenberries, cranberry jam, and still more fresh herbs and a leafy-green vegetation. Take the nose slightly away from the glass and find that these aromas somehow meld together into a manly, musky scent. On the palate, this Cabernet Sauvignon is surprisingly fruit-forward and the texture quite soft and smooth, but full with juiciness — indeed, it is like biting into a squishy, overripe plum that drips and drools its innards down the sides of the mouth. The tannins come in forcefully but purposefully about 3/4 of the way through, and with them a darkness of dried tree bark, dried eucalyptus leaf, plump prunes, dried figs, and dried black tea leaf. The finish is both solid and lingering: As the tannins thinly and gently coat the tongue, there’s a pleasant aftertaste and aroma of warm forest air. NOTE: I decanted the Adobe Road 2013 Bavarian Lion Vineyard Cabernet Sauvignon about 90 minutes prior to enjoying this wine with my meal. While this Cabernet Sauvignon can be enjoyed out of the bottle, be warned the tannins will hit much sooner (about 1/4 of the way through), and the texture will be much more boxy than round. Food Pairing: I paired the Adobe Road 2013 Bavarian Lion Vineyard Cabernet Sauvignon with an herb-crusted lamb rack, beetroot purée, and a goats cheese and arugula salad tossed with dried cranberries and pistachios. This was the perfect pairing. The gaminess of the lamb and its natural juices that were still present in the medium-rare cooking of meat calmed down the tannins quite a bit and brought forward the beautiful fruit flavors, amplifying the wine’s innate juiciness. Meanwhile, the natural earthy-sweetness of the beetroot complemented the softened tannins; and the vinaigrette in the salad brought forward just a hint more acidity, keeping the flavors of both the wine and the meal fully alive. More Info: I received the Adobe Road 2013 Bavarian Lion Vineyard Cabernet Sauvignon as a sample for review. (Cheers Gail!) Retail: $78. For more information about Adobe Road Wines and to purchase wines directly, please visit the Adobe Road Wines website.